Those of us who have residential window tinting are able to enjoy the variety of benefits that it offers. 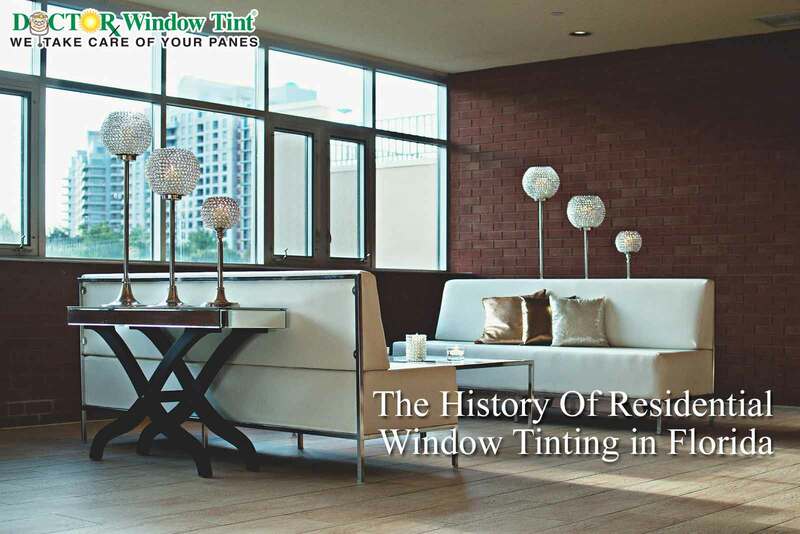 However, the history of window tinting and why it became more common place in Florida is something that not many know about. At one point there was a significant increase in demand for power supply during the summer, this demand lead to continuous power spikes which affected homeowners all over Florida. The local power company (Florida Power and Light aka FPL) couldn’t meet the rising demand caused by homeowners turning their household HVAC systems up high and trying their utmost to beat the heat. FPL decided that the best way to combat the increase in power usage was to incentivize households to have their windows tinted. Aside from adding to the aesthetic appeal of your home, residential window tinting has been proven to reduce energy consumption and improve waste reduction as well as act as a visibility obstruction to potential burglars. Home window tinting comes in all shapes and sizes and there are films which act as a security buffer. Florida Power and Light believed in the powers of window tinting to reduce energy consumption. When you take into consideration the fact that normal window panes are terrible insulators and allow hot/cool air to escape and enter your home, you will realize that your household HVAC usage will increase accordingly to maintain the room temperature that you’ve selected on your thermostat. If less sunlight and by extension heat entered households, people would make use of the air conditioners less. This would ensure that everyone is using less electricity across the board, but to get people to install window film on their residential properties, the company had to incentivize people to do it. Many homeowners were offered rebates on the installation of window films. Homeowners were thrilled with this concept: They were paid to install window film, by receiving substantial cuts, AND because of the tinted film on their windows, they were able to reduce their overall household energy costs. Thanks to this initiative, FPL was able to stabilize the local electrical grid and cut down on the number of power spikes that were occurring. Window film will help you improve your homes aesthetic appeal, especially if you’re considering selling your home. It shows buyers that you’ve taken the time and effort to not only alter the look of the property but have also considered the security aspect of a window tint. Aesthetically, window tint will also help protect the inside of your home but in terms of security, an opaquer tint will deter potential burglars as they cannot see inside the property. Doctor Window Tint is the exclusive installer of a security window film known as Solar Control® which will not only deter criminals but could also help protect your person and property from powerful storm damage as the glass will not shatter due to the nature of the window tint that is applied to it. When the founder of Convenience Window Tinting in Miami moved to a different country and sold his tinting business to his employees, Solar Control® was born. By maintaining a high caliber of work which included all aspects of product development, installation and customer service, Solar Control®’s reputation flourished. The company’s reputation was so that that it attracted the attention of the US Government to install protective film at a government facility in a foreign country. Unfortunately, soon after the installation process was completed, a car bomb was set off outside of the building but thanks to Solar Control® film, all of the windows shattered but did not fall apart as they were held together by the window film. This ensured that the injuries of staff members and visitors inside of the building were not as severe as it could have been. Don’t take unnecessary risks with your safety. Protect your home by installing residential window tint today. If you have any questions, don’t hesitate to contact the team at (305) 827-8468. We take care of your panes so you don’t have to!